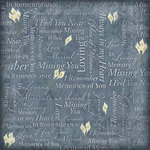 Honor the memory of someone special who has passed with the 12" x 12" In Loving Memory patterned paper by Scrapbook Customs. 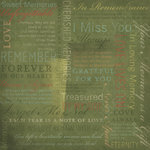 This double-sided paper is ideal for a memorial album or to display at a service. It is from the Religious Collection. Love the quote and fonts...plan to use a picture of deceased in the clouds' radiance. 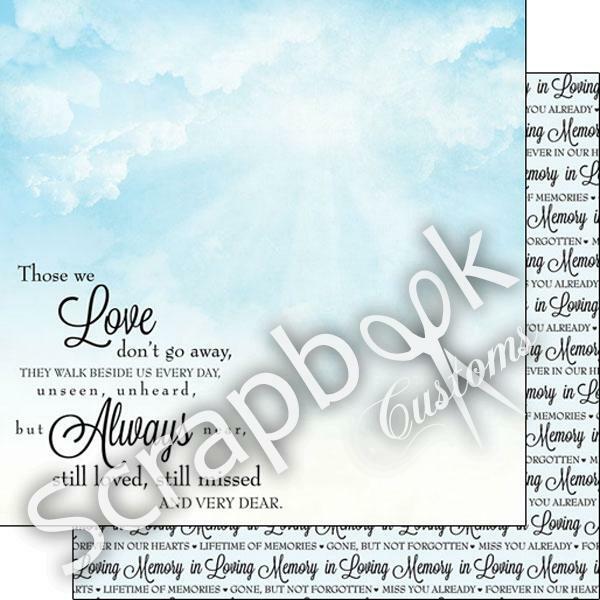 Is the words Srapbook customs also printed on the cardstock paper along with the design. I only ask because I once bought a dog cardstock paper from them and there was printing on it, it looks like a bill or something. Yes I saw it on the piece when I ordered it, but didn't think it would be on the piece they sent out. Thank you for taking the time to answer my question. By: crabapple1 (20-Mar-18) Helpful Question? Yes | No Thank you! Report Inappropriate This question has been reported. Thank you! No, that is on there as a watermark only. Will you please email me the dog paper you ordered to [email protected] with your information and I will have our retail department look into replacing that for you. 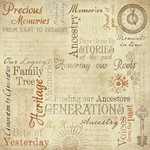 By: Scrapbook Customs (21-Mar-18) Helpful Answer? Yes | No Thank you! Report Inappropriate This Answer has been reported. Thank you!